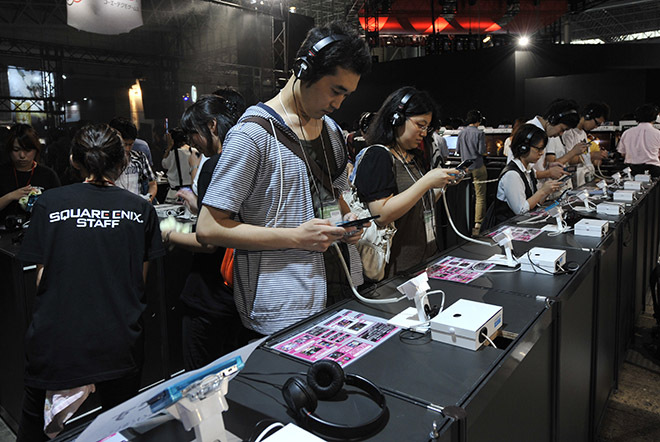 Tokyo Game Show visitors try out Theatrhythm Final Fantasy on the opening day of the show Thursday. 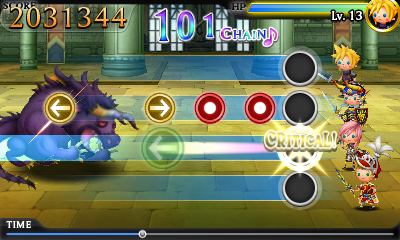 TOKYO — As soon as Tokyo Game Show opened, I made a beeline for Theatrhythm Final Fantasy . The promise of a rhythmic music action game based on the great music of the Final Fantasy role-playing game series proved much too much to resist. I was pleased to find that the demo version of this Nintendo 3DS game lived up to the promise. Much in the same way that Final Fantasy role-playing games are divided up into battles, exploration and cinematic “event” scenes, so is Theatrhythm trifurcated. Each of the game’s three types of music has a slightly altered gameplay structure, which makes it significantly more complex than your average music game. Of the three, the “Battle music” is the simplest. As the music plays, dots and arrows scroll from the left side of the screen to the right, ending at markers on the right-hand side on rhythm with the musical track. Songs in the demo included the classic “Clash on the Big Bridge” from Final Fantasy V and the prototypical, pulse-pounding, 8-bit fight music from the first Final Fantasy . A circle means you simply have to tap the screen. An arrow means you need to swipe on the touch screen in the direction of said arrow. A long bar-shaped marker means you have to hold the stylus on the screen and let go precisely when the bar reaches the end. It’s not so hard to pick up on the gameplay, but the timing is pretty exacting — like Konami’s Beatmania series, you’re graded on how precisely you hit the mark, so you might get a perfect rating (called a “critical hit,” naturally) or just a “good” if you’re a little off the beat. So it’s not too hard to clear songs (although you get a Game Over pretty quickly if you miss a few), but it should be challenging to put up high scores. The “Field music” segment gets a little more complicated. There’s only one line, but it curves up and down the screen as it scrolls. You’ve got to drag the stylus to keep your cursor over the line during the extended bar-shaped markers. While you’re doing this, you still have to tap the plain circle markers. So you’re going between moving your cursor and tapping the rhythm. This slower-paced segment is set to more relaxing music like “Terra’s Theme” from Final Fantasy VI . Finally, the “Event music” segment features songs pulled from the cinematic moments of the game. In this mode, a cursor travels over a winding, looping line on the screen, and you have to read the rhythm of the markers from this line. Since it curves around itself a lot, it’s slightly more complicated to pay attention to the patterns of the level and how they relate to the music. 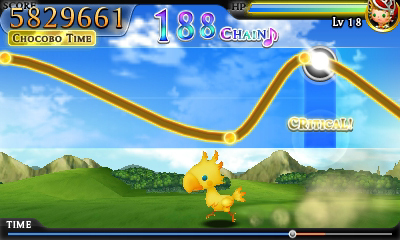 'Chocobo Time' in the 'Field Music' section. Based on what I’ve seen in the demo version, the full game (to be released sometime next year) will have three songs from each of the Final Fantasy games, one for each type of gameplay. Many of the tracks were listed in the demo, but grayed out and not available to play at the Tokyo Game Show booth. Of the songs that I played, the one I liked the most was “Clash on the Big Bridge.” Furiously tapping and swiping the pen to the beat of this classic song felt really good; the level design was so well-suited to the music that I felt like I was making the song happen. Each of these types of levels features a different sort of graphical accompaniment. The battle sections show your characters fighting a variety of enemies with goofy, cartoonish designs. The field sections show one character walking along, occasionally encountering others. And the event sections are a little different: Instead of new graphics, they show clips from the FMV sequences of the original games. There are certain sections of the song, one in each level, in which the color of the markers will turn silver. If you complete these sections perfectly, something special will happen. In one field song, it became “Chocobo Time,” and suddenly my character was riding along on a giant yellow bird mascot who squawked with each beat. In one battle section, I summoned Odin to fight alongside me (and probably net me more points). Final Fantasy ’s musical soundtrack is one of the series’ greatest assets, one that Square Enix clearly appreciates. Based on the demo at Tokyo Game Show, the company seems to have come up with a solid plan for building a game around these enduring tunes.